Try The Dowel Roller Kite Today! Hi! I'm Tim Parish, a former glider-pilot and now a self-confessed 'kite nut'. I just love getting out to fly something home-made, like this Roller kite, any month of the year. Often on my own - can you relate to that? I've been at it for a number of years now, testing and refining many single-line designs. I'm sure you'll enjoy this one! An efficient MBK Dowel design, like this tail-less Roller kite, is so cheap to make. Yet it will hang up there in very light winds long after many heavier store-bought kites drift to the ground. 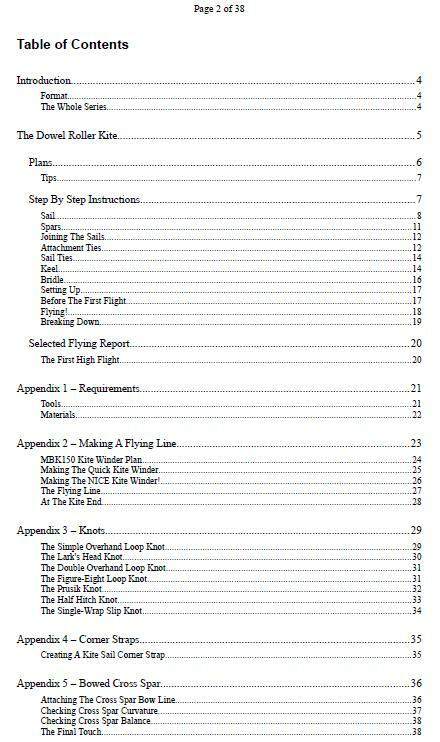 The complete step-by-step instructions plus plans cater for all kite-building experience levels, with a detailed Table of Contents to save you time. At 1.2 meters (4 feet) across, this kite is a decent size and generates a satisfying pull on a 50 pound flying line in moderate winds. In the lightest winds, even your fairly young son or daughter can hang on for a while. Don't be frustrated on very light-wind days! Chances are your Dowel Roller kite will still fly OK. Particularly when towed above tree-top height - an extra knot of wind might be all it needs. 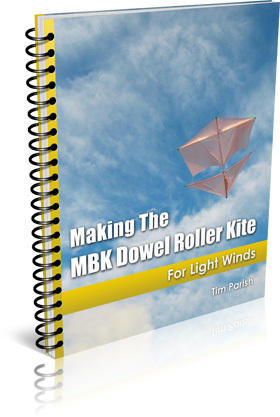 An MBK Dowel kite is a relatively quick build compared to more conventional fiberglass and cloth kites. Even allowing for gluing time, only a day or 3 need pass before the results can be enjoyed. Not only convenient for you, but it's also good for family harmony! Neatness and space are soon returned. Even if you have some experience as a kite-maker, the detailed Table of Contents makes it easy to pick and choose just what you need to finish this high-performance kite. Store-bought kites are OK, but there is something extra to enjoy when that thing flying up there was made with your own hands! Even before it flies you'll have fun as the Roller kite takes shape on your shed or living-room floor. When finished, bask in that "I made it myself" feeling. It's nice knowing you are assured of a high-performance kite, just by following the instructions! Customers sometimes tell me how their kite flew so well, on the first attempt. You will be shown how to extract the most from your home-made Roller kite. Despite the rather ordinary materials! Have the satisfaction of seeing your creation fly 'like a bought one' or most likely, better. Amaze people down at the park or beach when you tell them how little your Dowel Roller kite cost! Stay within your budget without compromising on flying enjoyment. The Roller is very much a 'light-wind kite'. Your favorite big store-bought kite might not stay up in the lightest winds, but now you can just fly the Roller kite instead! This is great if your spare time is limited. Imagine entertaining them as you hone your light-wind skills. When there is some time to kill, building the Roller kite is another option for 'enjoyable things to do'. For example, when you are on a holiday or vacation. This design can be quickly dismantled, rolled up and stored like a Sled kite. This long thin package can be taken just about anywhere, and can be ready to fly in just a minute or two. Perhaps you have bought a lot of kites, but only made very few. The information in the eBook is so complete, you are assured of success if you follow carefully. Materials, construction, knots, the flying line, even launch techniques are covered! Following the instructions exactly will ensure the kite is accurately made. The sail will be very symmetrical and so will the horizontal spar curvature. This is a real head start to getting a balanced kite that flies straight up! How are you with knots? Even though you might have your own favorite knots for bridles and lines, all mine are fully explained and illustrated in the eBook. Just in case! That is, a report of an actual outing with the original Roller kite. Get inspired to have some good high flights with your new kite too! You might know plenty about handling single-liners, but you can still be entertained by someone else's flying experience with this kite. Print out the e-book as a ready reference while making your Roller kite. It's formatted to come out clean and neat, with no awkward split pages or lines. It's not a bad idea to keep each Appendix stapled separately. You can then refer to only those you need at any given time. Why might you prefer the Roller kite over the other 7 in the Dowel Series? Why, because it is such a good-looking kite in the air! More interesting to see in flight than a simple Sled or Diamond. So, are you ready to loft a super-cheap kite this week-end? Who cares if there's hardly any wind, your new Roller should still hang up there! Follow through the complete step-by-step instructions in your spare time - it's nothing hard. And then look forward to feeling that flying line tension up as your impressive Roller kite heads for the clouds! "So, got inspired to build a Roller by this site. It took about 6 hours, but I used taffeta nylon instead of a bag. It was OK for a first try. When I got to the beach over in Newport, Oregon I let it out in about 8 mph winds hoping for the best. I flew from altitudes varying from 100-300 feet and it flew great the whole time. ... It's a great design. If you're thinking of building one - DO IT!"